What if I told you I had a resource for you that would allow you to create beautiful, visually stunning social media posts, web stories and animated videos quickly and easily? If you can type text, you can use this tool! It’s really that simple. Would you be interested in hearing more? If so, I gotcha covered! Adobe, yes, THE Adobe has rolled out a brand new web-based platform and iOS apps that incorporate the best of three of their mobile apps, Adobe Voice, Adobe Slate and Adobe Post. The new Adobe Spark suite includes Adobe Spark Video, Adobe Spark Page and Adobe Spark Post. Adobe Spark is kind of like a “Photoshop for Dummies” tool for those that don’t have the time or money to invest in learning Photoshop. Traditionally, Adobe is known for their high end professional tools like, Photoshop, Illustrator, etc. but they are also known for steep learning curves and prices, right?! You might not have a lot of graphics skills or even the money to buy high end design software but you still want awesome graphics, right? Then you are going to be super excited to start using Adobe Spark! Oh and did I mention that you can create from your desktop as well as your smartphone?! oh and that it’s FREE?! Yeppers, TOTALLY FREE! I have to say thank you, Adobe! Thank you for creating a GREAT tool for the regular folks who just want to create amazing visual content quickly and easily! To get started, simply pop over to Adobe Spark and sign in with either your Facebook or Google account. When you do this, all your work will be auto saved and will be sync’ed and accessible from the desktop OR your iPhone or iPad. This is SOOO awesome! How many times have we created something on our phones and/or on our desktop and then when we need it, it’s inevitably on the device we don’t have in front of us, right? Additionally, it’s auto-saved so if you get sidetracked, you can come back later and finish your design! *Unfortunately, the app version is not yet available for Androids. But the good news is that Android users still have access to the desktop tool! Adobe Spark Post lets you quickly and easily create professional graphics for your social channels. Adobe Post has pre-built social media platform templates that you simply click on and you are set! You don’t even have to know what the measurements are…all you do is click and away you go. If you can type text and click to change the “look”, then you are going to LOVE this part of Adobe Spark! The mobile app allows you to create animated graphic tiles for your social channels! Oh yeah! I can so relate to this one! How about YOU? ? Adobe Spark Page helps you quickly and easily create web stories. You can, with a few clicks, create beautiful visual stories, photo albums, online newsletters or portfolios or anything else that you want to present from a web browser. 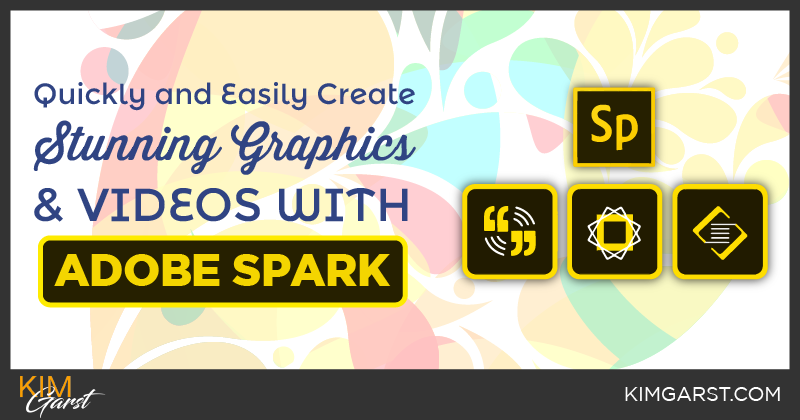 Adobe Spark Page is simply put, a very simple web publishing platform that allows you to showcase your content in a very visual way. Adobe Spark Video is one of my favorite parts of the Adobe Spark suite since video is soooo huge on social media right now…specifically, on Facebook and Instagram. With this resource, you can quickly create voice-over videos or simply use music as a backdrop for your video. Spark Video comes with some creative commons music selections or you can upload your own music. Again, if you can type in text and click on selections then you can make amazing videos, quick as a bunny! It took me about 10 minutes to create this one! Again, the sweet spot about these tools is that they are quick, easy and FREE! OK, now that I have told you the good stuff, are there any negatives to Adobe Spark? Yep, a few but they are just that, a few :-). Keep in mind, this is a relatively new tool and like all new things, there are always a few bugs and things that you don’t like and hope that they fix. The list of things that I don’t like is pretty short and I know they are working on one of these things already. My biggest complaint is that you cannot brand your graphics or videos. In other words, you cannot insert your logo on your graphics or videos. In fact, Adobe Spark Post inserts a #AdobeSpark hashtag on your graphics that forces you to “share” them before you can remove it. Not crazy about this but the good news is that you only have to do it one time. The Adobe Spark Video also adds a slide that has their branding on it that you cannot remove and Adobe Spark Page also has a “made with” advertisement. One other small drawback is that you have no control over the export settings. Very small issue in the big picture! Overall, I am loving the Adobe Spark suite and feel it’s a huge resource for all business owners who want to bring their stories to life and create stunning visual content without quickly, easily and best of all, for FREE! Definitely give these tools a try and see what you think! I would love to hear from you when you do! *DISCLOSURE: Adobe has engaged me as a brand ambassador. That said, all opinions in this article are my own. awesome sauce this is great because who doesn’t like watching videos – great share – thank you. One thing that I’m not is an expert at photoshop. 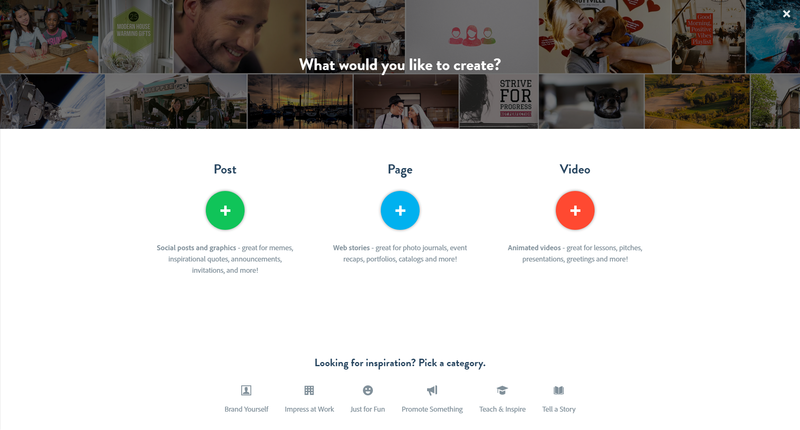 I started using canva and visme, but this would be a great alternative to these two tools.. This would be one tool I may have to add to the list. Very valuable Post, I can tell you put a lot of effort into this. I’ve been doing graphics online since 1999 and have never found the need for using the Extremely overpriced adobe photoshop! There are so many free High Quality alternatives. Maybe I’m just old fashion but just the company name adobe makes me want to cringe and hide my wallet. Adobe Spark looks like a great tool and I will definitely give it a try with the other tools that I currently use. It seems as if it allows access to posts as well as videos which is important in my branding. I also can’t turn down a free tool that is able to help my business explode. This a such a great share for a new tool for video creation options! I am not a graphics or photoshop expert at all (Canva has saved me) – can’t wait to try this tool! Let’s see. How far ahead Adobe takes us. I am using Canva/Fotor/Buffer/flamingtext/online image editor for good. Hi Kim. It’s actually not that helpful unless you’re on IOS, as the Web app isn’t supported on Android mobile browsers so you have to be on a desktop computers to use it. Nice idea though. That is correct, Sarah. It’s only available on an iOS device at this time. Android is in the works! Hello Kim, I would be happy if this tool can replace the ghost graphic software I’ve trying to learn since weeks now. Its hard for me – I mean PhotoShop. Thanks for revealing this app. I will give it a try sir!!! Can we create web page design with this tool?? You can, yes, using the story feature. This sounds like an awesome program and its products look fabulous! Definitely going to have to look into it! Thanks so much for sharing this info and review! Great post! Kim, this is great news. So glad you shared this! I mentioned this on a crowded webinar the other day with some pretty savvy people. None of them had heard of Adobe Spark. Thank you for making me look so smart! Thanks for aware me about this tool. adobe sparks sound a great tool. I will try and share my review. I am reading your blog first time and its really informative for me. Thanks for aware me about adobe sparks tool. I will definitely . I am a graphic designer and want to be an expert designer but I need to start from scratch. I am just using free Photoshop but after reading your article i will try to use this tool. Thanks for sharing this article with us.. keep sharing. I have started my career as a graphic designer .I am a beginner in this field and I came to know about huge informative tips from here .I must appreciate the way you have mentioned everything important that is related with graphics and its designs. I have heard about the tool named Adobe sparks.It is an amazing tool i have ever come across.I am definitely gonna use it in my course to explore more about this tool .And take maximum advantage of it. Hi Kim, Thanks for the heads up! Neat…. even though I don’t have ios but do have a PC…. I like Canva.com. It’s free and you can upload your logo to insert them in graphics. They have templates in all the right sizes for social media. I use Canva a lot as well. Another great resource. I now have a list of over 1000 images in Spark –is there any way to randomly choose as image, or reverse the list sequence ? Ԝow, amazing Ƅlog layout! You make blogging look easy. The overall look of your sіte is еxceⅼlent, lеt alone the content!